These Farm Heroes level 182 cheats and tips will help you beat level 182 of Farm Heroes. 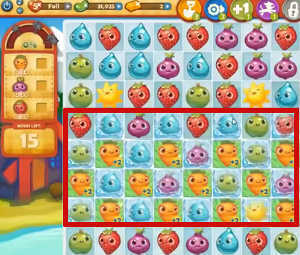 The objective of Farm Heroes level 182 is to achieve 100% growth by growing 24 carrots, 30 red onions, and 30 strawberries in 15 moves or less. The blocks of ice are Farm Heroes Saga Level 182’s most annoying blockers. They divide the grassy squares from each other, making the middle of this grid a checkerboard of ice and grass. 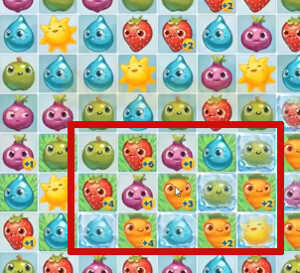 Make matches with the raindrops inside the ice to free them and remove them from the board. You can’t spend too much time with the raindrops, as they won’t get you any closer to 100% growth just by removing them. However, by clearing one side and working your way over, you can get to the bottom and start using some of the grassy squares to set off cascades. Getting 84 cropsies in 15 moves is no small task. Maximize every move by forming 4 or 5 cropsies into a large match near the bottom, where nearby cropsies can get bonuses as a result. Once these cropsies are powered up, removing them won’t just set off a potential cascade–you’ll be leagues closer to your goal. Remember to think carefully before every move you make. Removing the ice must come before large matches can be made to greater effect, so be sure each move counts! 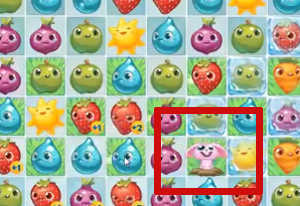 The rabbit in Farm Heroes Saga Level 182 is especially malicious, popping up to remove cropsies from grassy squares blocked in by ice and robbing you of valuable bonuses. It may be worth investing a few magic beans in a shovel to paralyze the pest for two turns so you can gain some ground.